D-Ring Thumb Spica and Wrist Splint One of our most popular and highly recommended wrist braces and supports is the Comfort Cool D-Ring Thumb and Wrist Splint. 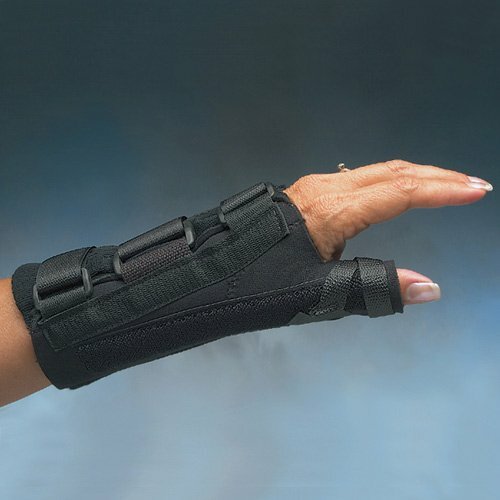 Ideal for people with wrist and thumb problems, this splint offers rigid support and can be adjusted to fit your hand by one of four Velcro straps. This brace has the same features as the Comfort Cool D-ring Wrist Splint with the added benefit of thumb immobilization. Perfect for skier's thumb, gamekeeper's thumb and de Quervain's syndrome, and many other conditions that require rigid support such as ligament instability, sprain or muscle strain. The included metal stays in the wrist and thumb areasbend to conform as needed and can be removed as the condition improves. The state-of-the-art perforated Neoprene construction provides flexible, breathable, and comfortable support for extended wear. An excellent compliment to wrist rehabilitation and recovery, buy your Comfort Cool D-Ring Thumb Spica and Wrist Splint from ActiveForever.com today! D-Ring Thumb Spica and Wrist Splint Features: Available for both right and left hand Offers substantial support for the wrist and thumb Lightweight, breathable fabric Velcro immobilizer provides unmatched thumb support Multiple sizes allow for an exceptional fit D-Ring Thumb Spica and Wrist Splint Specifications: Available in XS, S, M, L, and XL sizes 1/8" perforated neoprene construction Included 6" removable metal stays Latex Free To size, measure palm circumference across top of palm and around hand across top of knuckles. Left Right Size Palm Circumference A12028 01 A12028 02 X-Small 6"-7" (15-18cm) A12028 03 A12028 04 Small 7"-7.75" (18-20cm) A12028 05 A12028 06 Medium 7.75"-8.4" (20-21cm) A12028 07 A12028 08 Large 8.4"-9" (21-23cm) A12028 09 A12028 10 X-Large Over 9" (Over 23cm) Returns: Due to hygiene purposes, this item is non-returnable. One of our most popular and highly recommended wrist braces and supports is the Comfort Cool D-Ring Thumb and Wrist Splint. This brace has the same features as the Comfort Cool D-ring Wrist Splint with the added benefit of thumb immobilization. Perfect for skier's thumb, gamekeeper's thumb and de Quervain's syndrome, and many other conditions that require rigid support such as ligament instability, sprain or muscle strain. The included metal stays in the wrist and thumb areas bend to conform as needed and can be removed as the condition improves.